As of March 1, the lineal foot cost for a local street will be adjusted to $228 per lineal foot, based on construction cost data and inflation. The City of Fort Collins annually evaluates the lineal foot cost for a local street. The lineal food cost in 2018 was $225 per lineal foot. The City of Fort Collins strives for a world-class transportation system which serves all modes of traffic. The Transportation Capital Expansion Program (formerly called the Street Oversizing Program)references City adopted plans and policies to offset additional traffic added to the existing transportation system by new development or redevelopment. Development categories are defined by the Institute of Transportation Engineers Trip Generation Manual, not the International Building and Residential Codes. The program collects fees from new development or redevelopment projects. These fees are due prior to the building permit is issued. The fees vary depending on the type of development: i.e. residential, commercial, office space, industrial, etc. 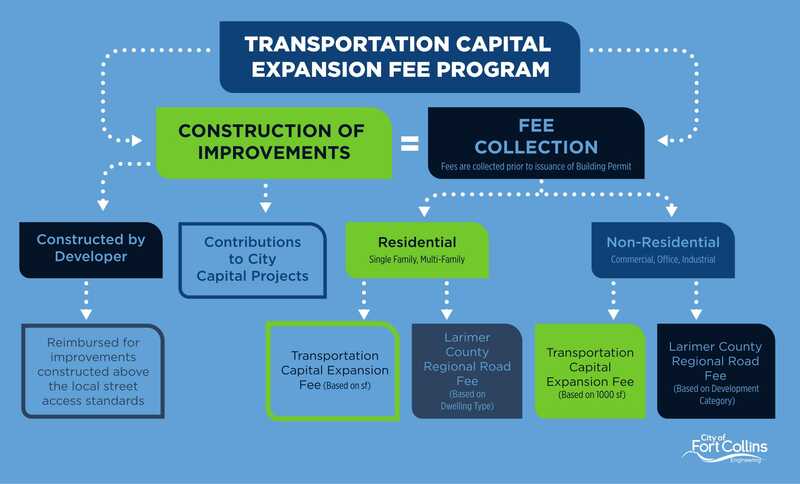 Per City code, the fees can be used to fund projects which reduce congestion or to reimburse development projects which construct roadway up and above the local access standards. All fees calculated using the above calculators are estimates. Final fees to be determined at issuance of building permit.